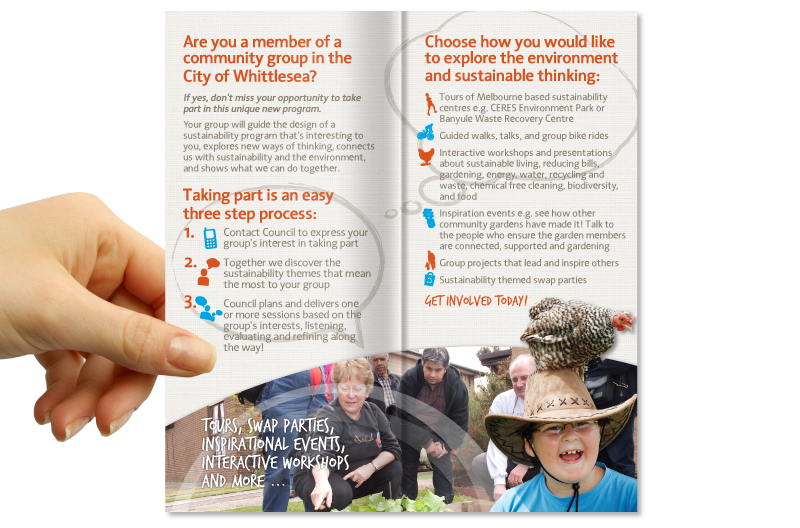 SOW (Sustainability Outreach Whittlesea) is a City of Whittlesea initiative that works closely with community groups to explore, discuss and implement community led sustainability programs. Working as part of the design team at Oneº I created the SOW logo, brand and associated print and digital communication materials. 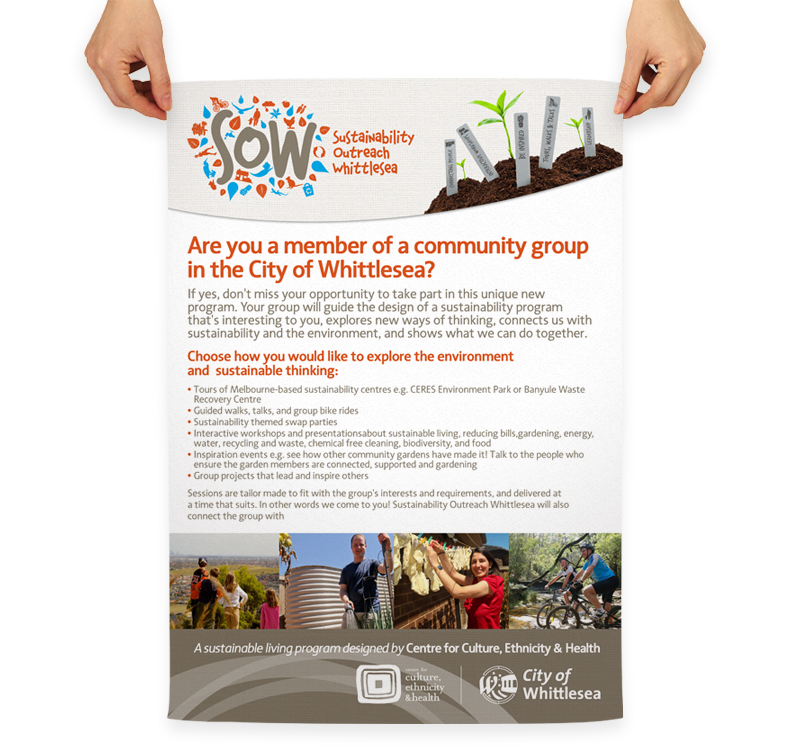 Visually the SOW logo represents diverse areas of sustainable living practices in the community such as local flora & fauna, community activity and interaction, energy, social engagement, leadership, ecology and more. Fun, free-form use of hand-drawn iconography with a hand-made, stamp-like feel was used throughout the materials to tie in with the playful, organic approach of the logo. Notions of ‘growth’ and ‘life’ inherent in the design elements represent the limitless initiatives that can be brought to life by the community via the program. Subtle use of natural earthy textures were used to create depth across various materials which allowed the content to breath whilst retaining clear, clean and legible communication of key messages. Strong community focused imagery was used to add life and personality to each piece. 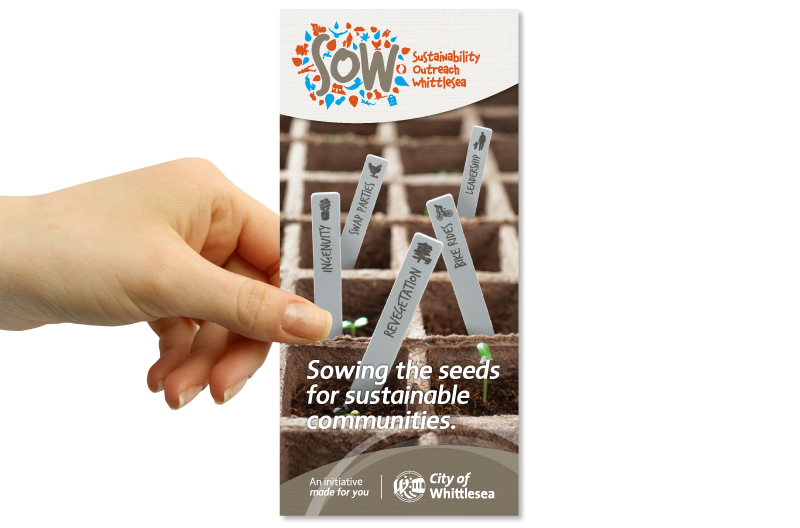 The seedling planter labels on the DL brochure piece tie in with the lively iconographic approach of the SOW brand creating intrigue whilst immediately conveying the diverse range of varied sustainable activities that the SOW program represents to all City of Whittlesea community members. Check out more great work from the fantastic fellows at Oneº.